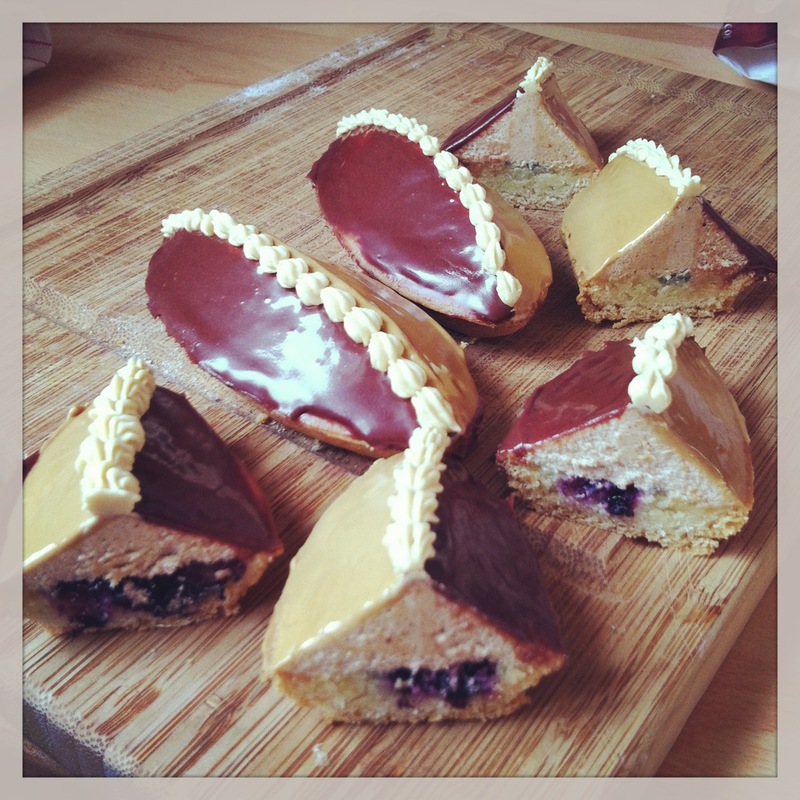 Barquettes aux Marrons, is a pyramid of chestnut+rum cream on a soft biscuit+rum base. The centre filled with a layer of blueberries. 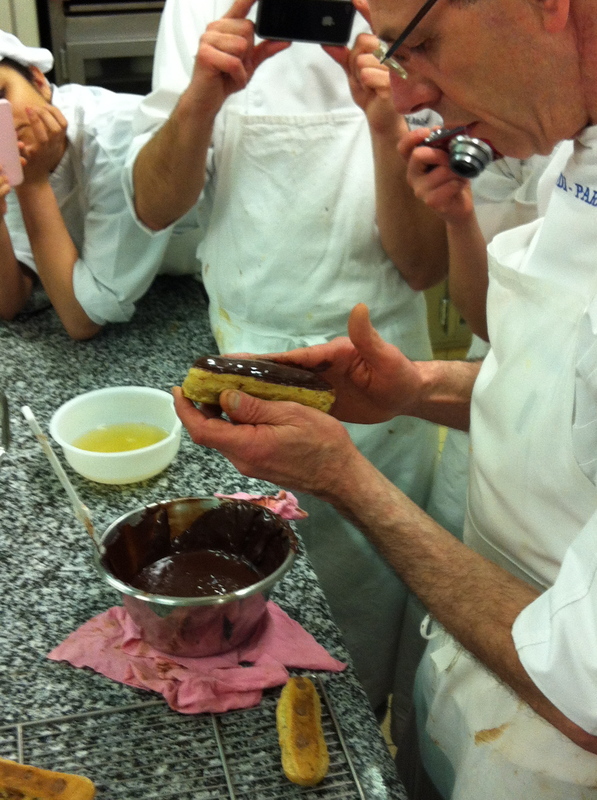 The outside glaze is 1/2 chocolate ganache, the other 1/2 coffee. Butter cream for decoration. Un barquette is a a little boat. When you see the cake moulds you understand why they’re named after little boats. But, when finished, I can’t help thinking ‘football’. Whatever their look, they’re delicious. But, I will say the rum is a little potent and that’s perhaps due to the quantity of rum or the quality. When you take your first bite you’re instantly hit by a rich almond butter cream and rum alcohol, but this richness is broken up by the taste of blueberries. 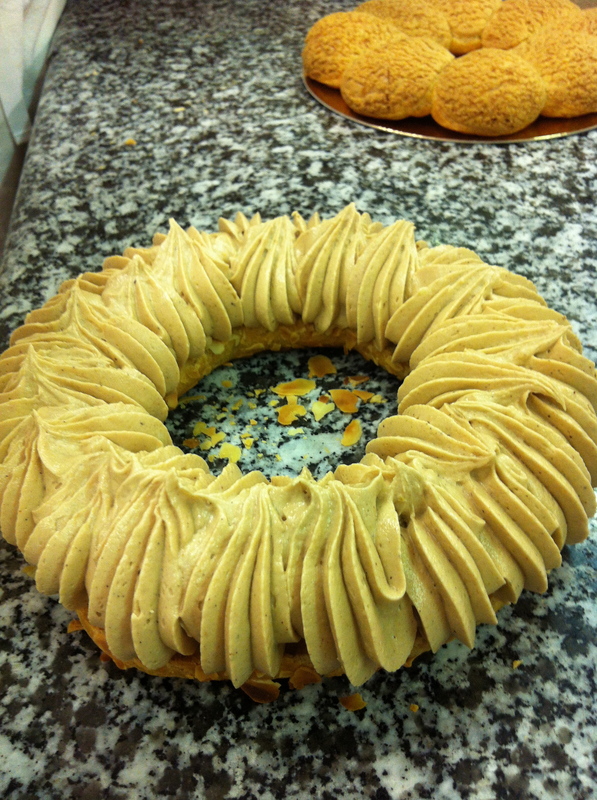 Mon cherie adore les Barquettes aux Marrons! He made the same comment as Chef, ‘to eat this there is the right moment’, and for mon Cherie that’s in the morning with a coffee. 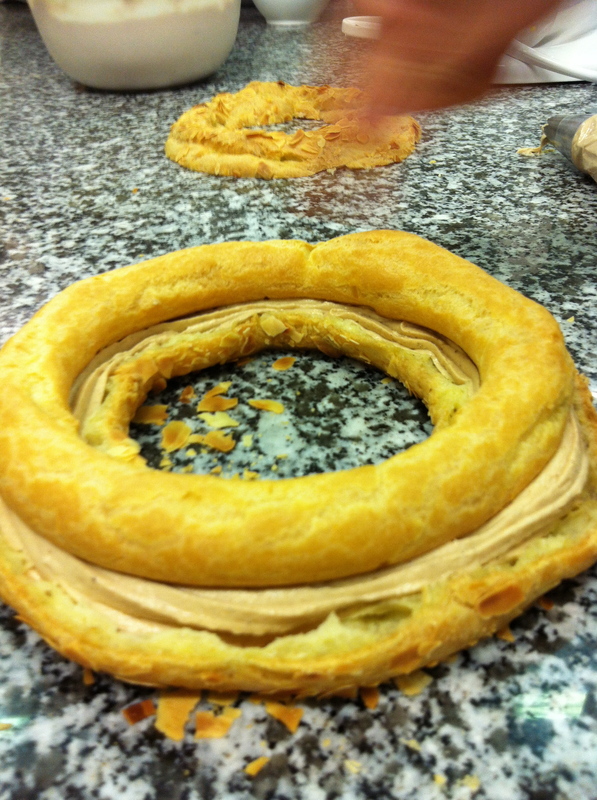 First, we made a sweet dough, Pate Sucre. Then laid it over the barquetttes moulds. 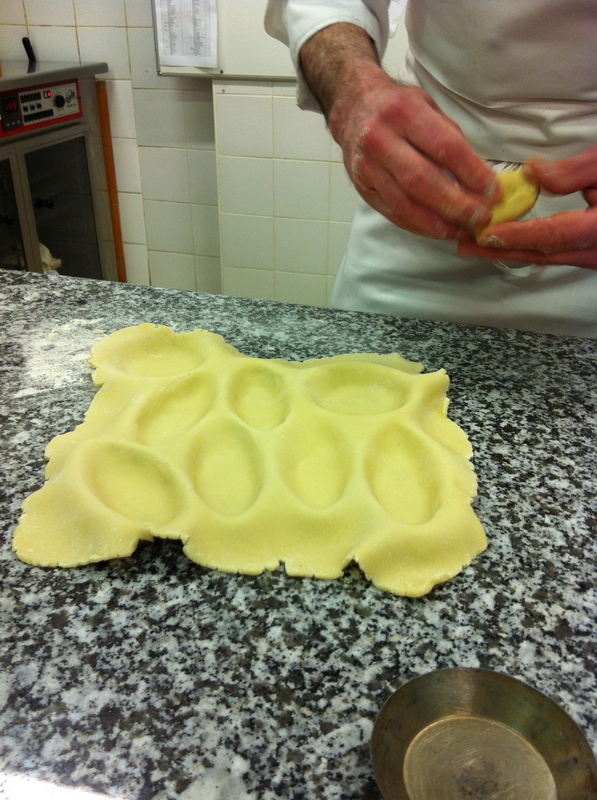 Pressed the dough against the mould with left over dough, rognure, which we made a ball out of. 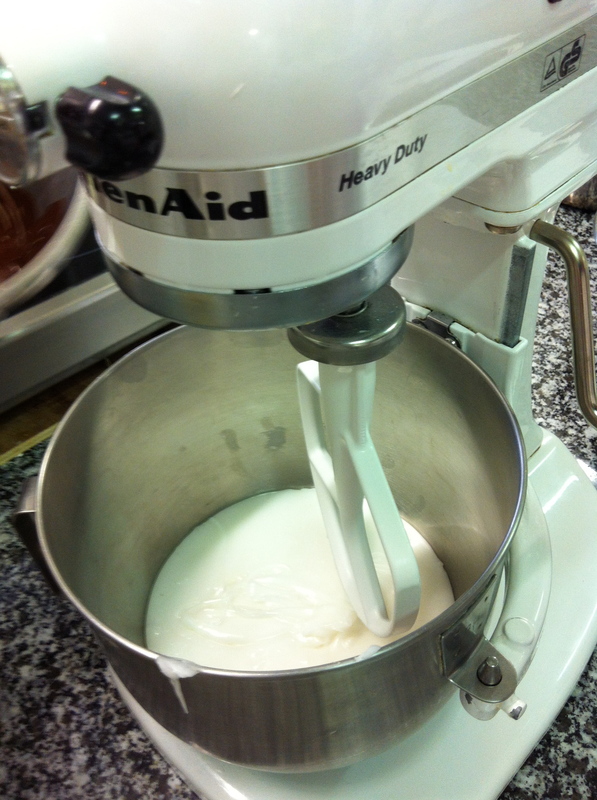 To break away the dough from the moulds, we rolled over two rolling pins. 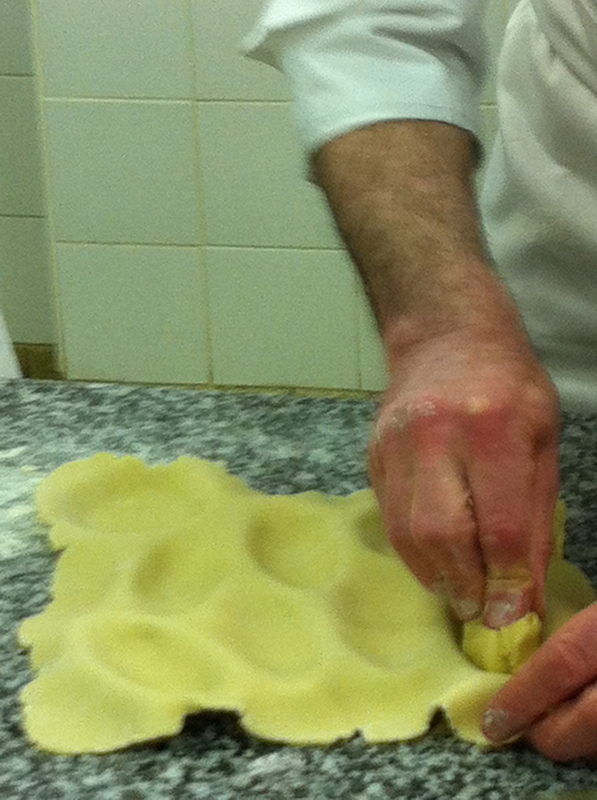 Then with a fork pierced the sweet dough. 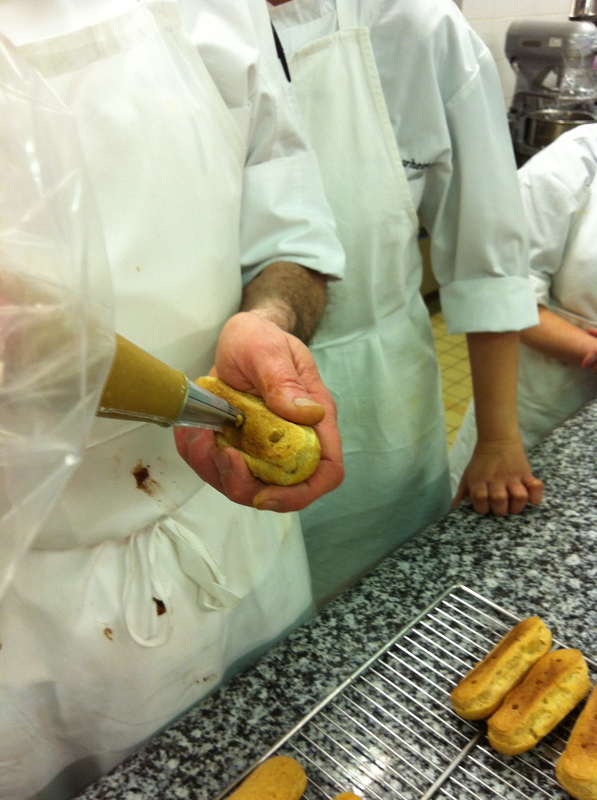 With a small tip size we piped the chestnut cream into the barquettes. 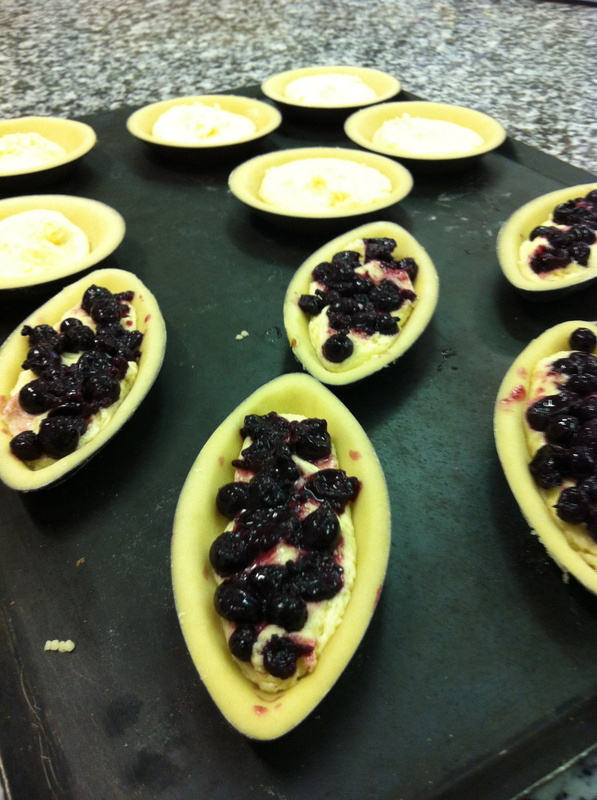 Then added the blueberries, les myrtilles. 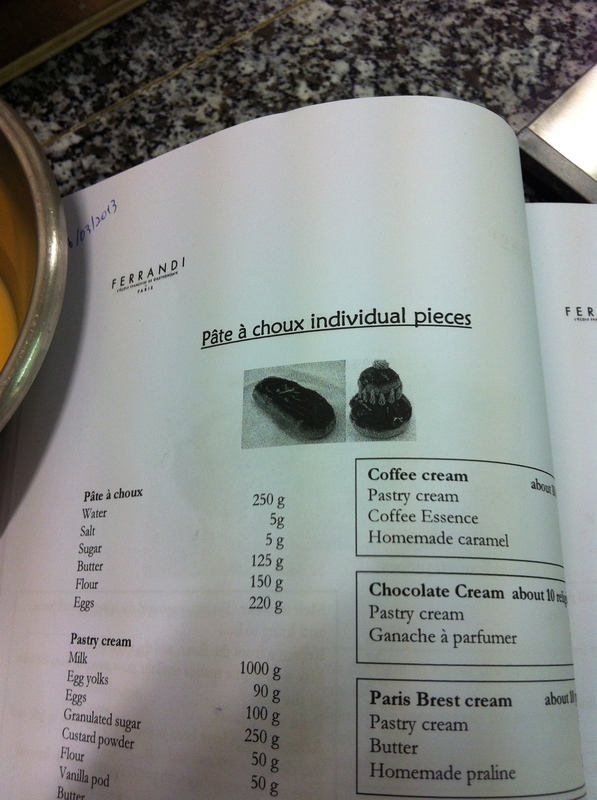 Now, for the almond and chestnut cream to make a pyramid/triangle plus the coffee and choclate ganache over the barquettes that you see in the above photo …. well, I forgot to take photos. Sometimes, we’re moving from one recipe to another recipe and we have to be quick and voila. … no photos. If anything, I need photos so that I can go the lesson of that day. Until the next French dessert recipe. Here we are. We’ve arrived to the famous BABA au RHUM. 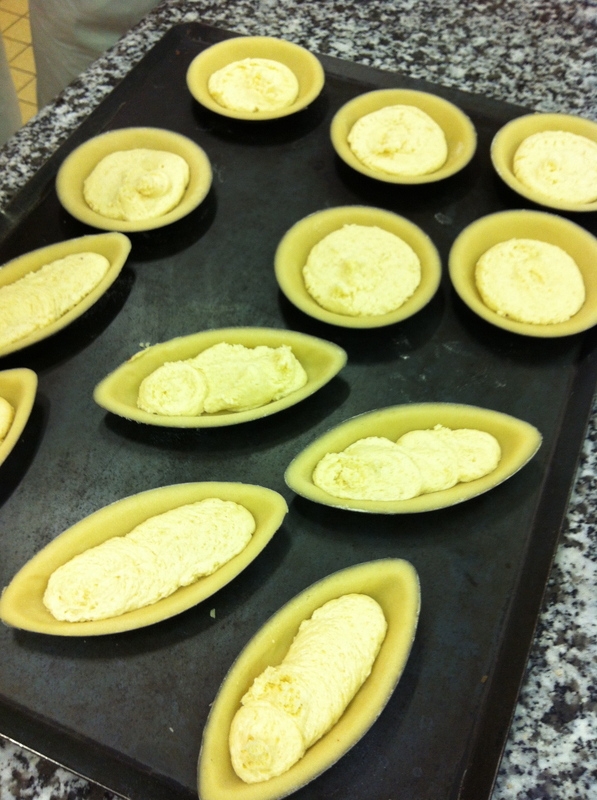 Babas, Savarins, Marignans are made of the same dough, pate baba, but each are different in shape. 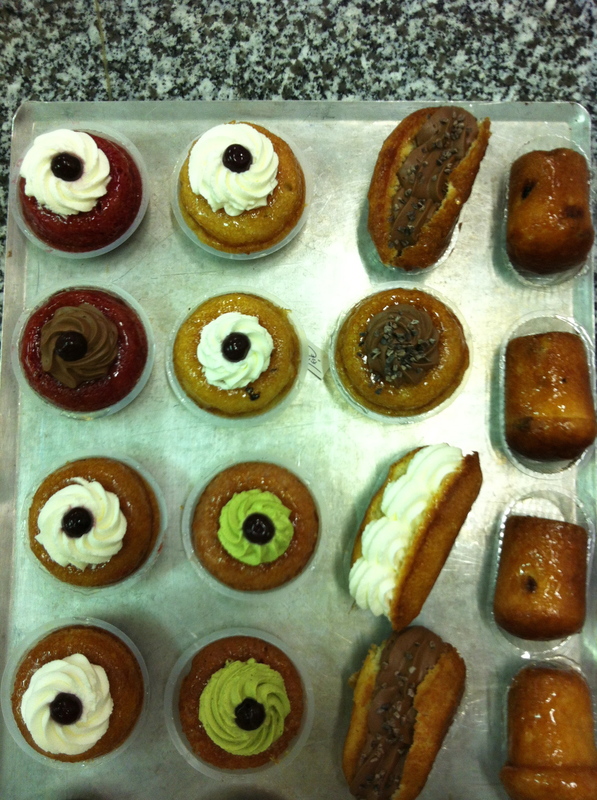 Each are soaked in syrup and drizzled over with rhum. Warning: You can not, I repeat can not replace rum with something else, and call it Baba au Rhum. 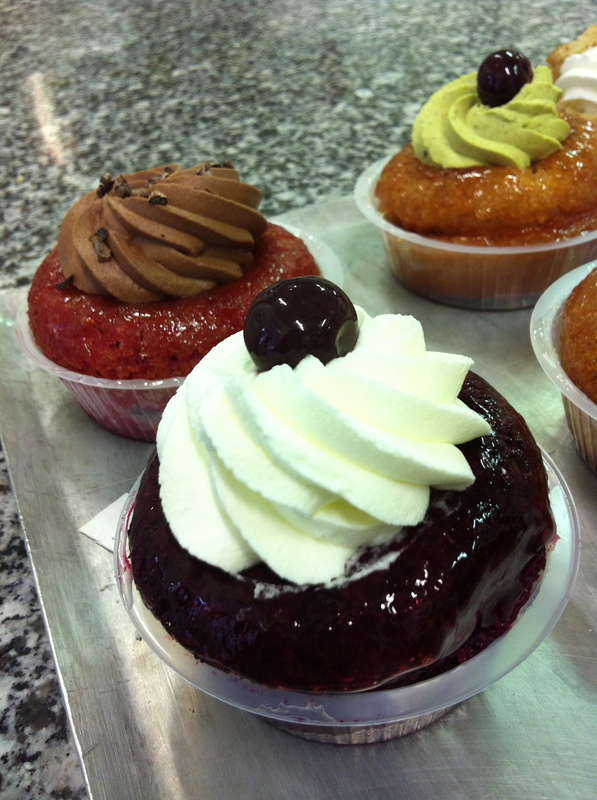 You will give French patissiers a heart attack and then kill all the childhood memories of every Frenchman. The Baba au Rhum is a true French classic. A student in our class doesn’t drink alcohol and when she asked Chef if she could not use rum, I swear I thought Chef went blue for a milli-seconde before he errupted. 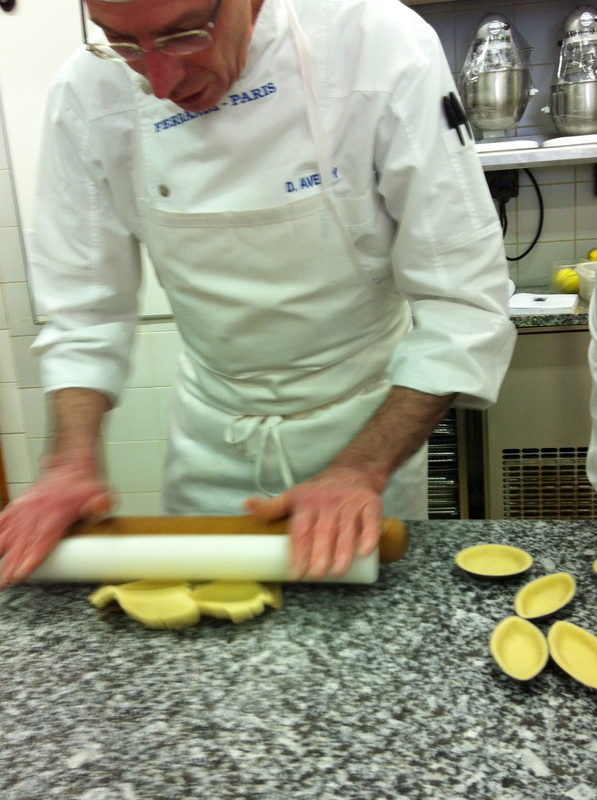 The Baba Bouchon, is the mushroom shaped baba. Bouchon translates to cork, like cork for a bottle of Champagne. 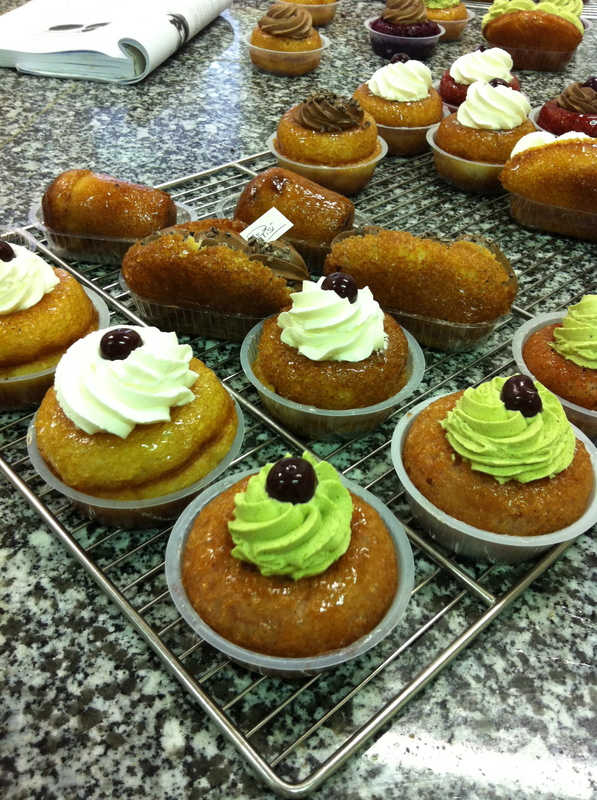 Savarins are the donut looking babas with a swirl of whipped cream in the centre (and cherry on top). 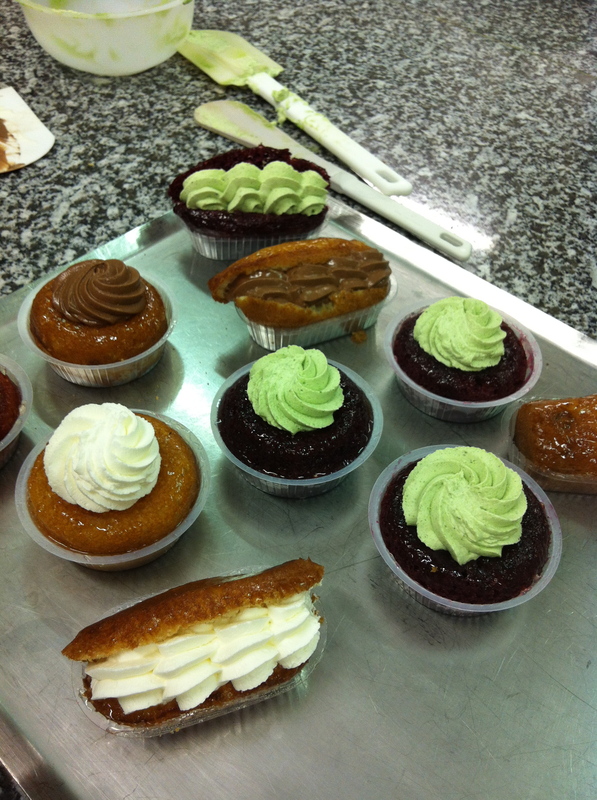 We made three types of whipped cream: pistachio, chocolate and classic traditional. 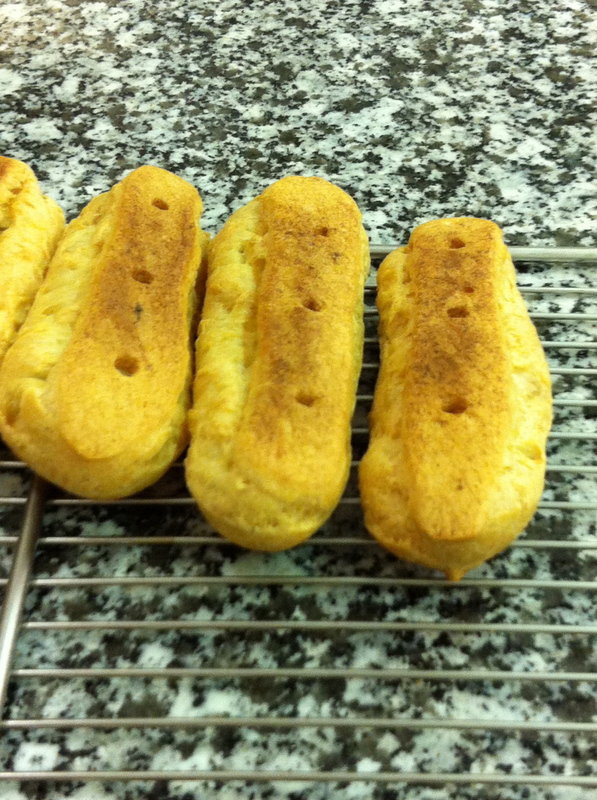 Marignans, I call them baba baguetts because they open up like a baguette sandwich only with frothy whpped cream inside. Mmmhh…….. The French word écoeurant is used to describe when one eats something that feels heavy, or is sickly to eat. 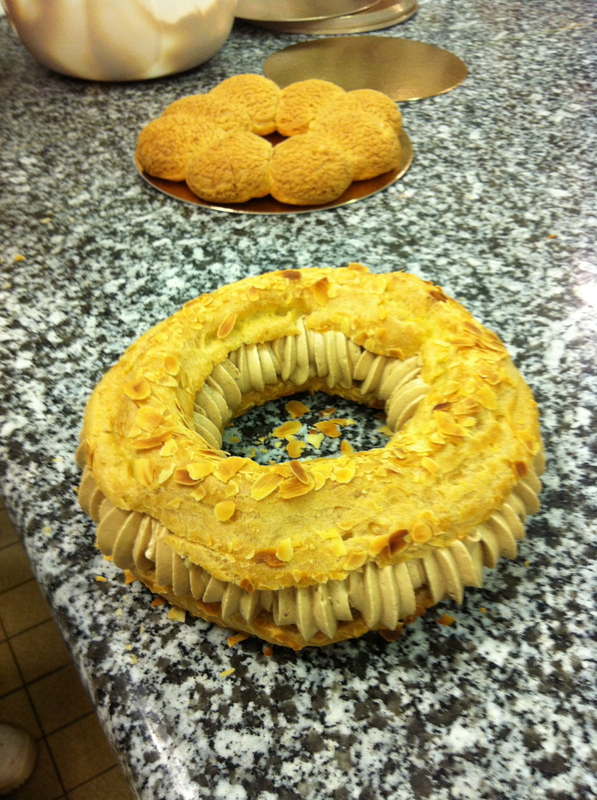 The Paris-Brest for some people is écoeurant. Is it the wall of stiffened butter cream piped generously around a sponge ring which gives that gagging reflex on the first bite? 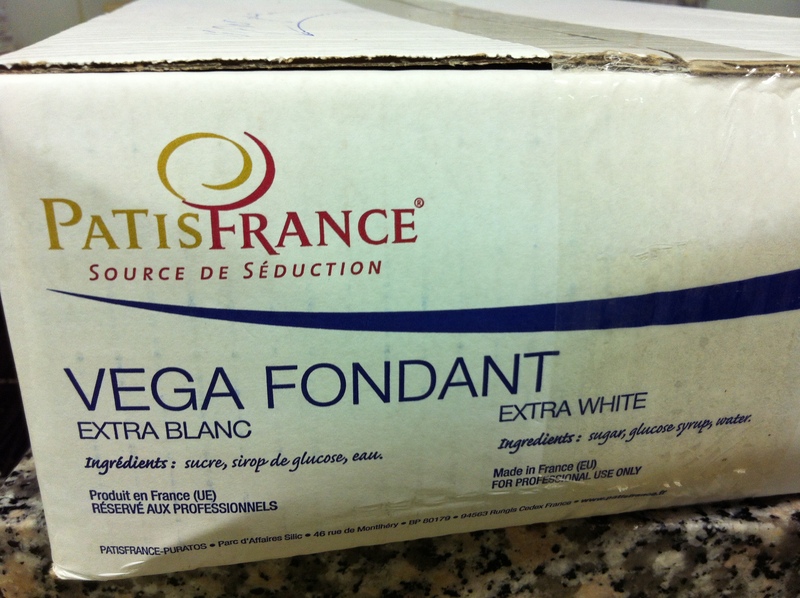 Though, it seems the French are divided on this one, for some, it’s their all time favourite. Maybe, it’s the roasted hazelnut flavour reminiscent of childhood winter vacations that gets so many French sentimental over just the idea of a Paris-Brest. 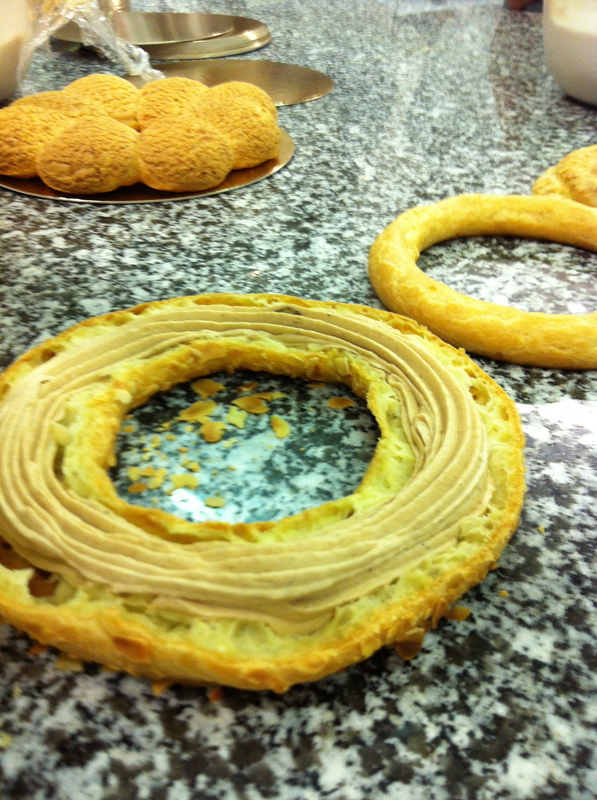 When I mentioned on Tuesday morning to my Frenchman that I would be making this at school on Wednesday, by Tuesday evening I had an order from 20 of his co-workers for their beloved Paris-Brest. Surprised and cynical as I was, even I knew that what we were about to make would be a recipe more evolved, totally edible and perhaps a real money maker. 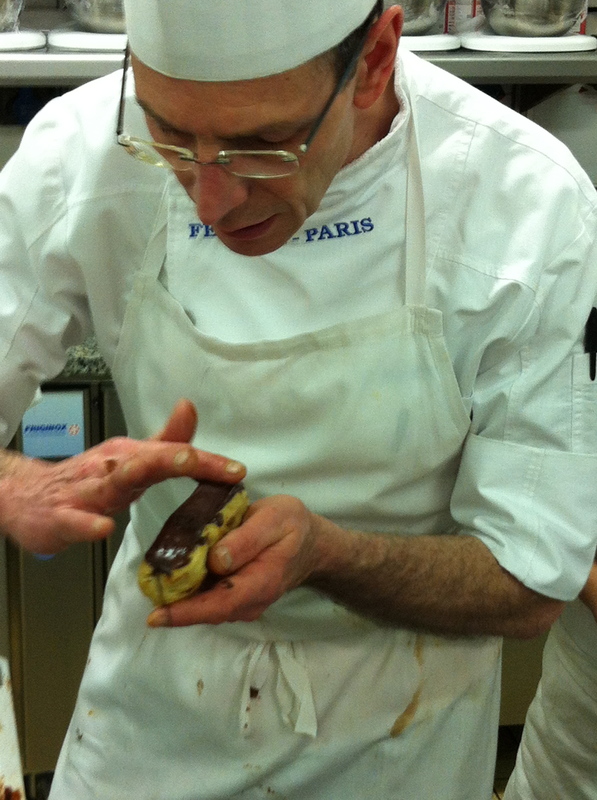 Chef has been saying for quite some time the Paris-Brest “il va être à la nouvelle mode”, or “on va revisiter”, meaning it’s coming back or being revisited. Often in class we are on the subject of fashionable pastries, because at the moment we are in a world craze for macarons. 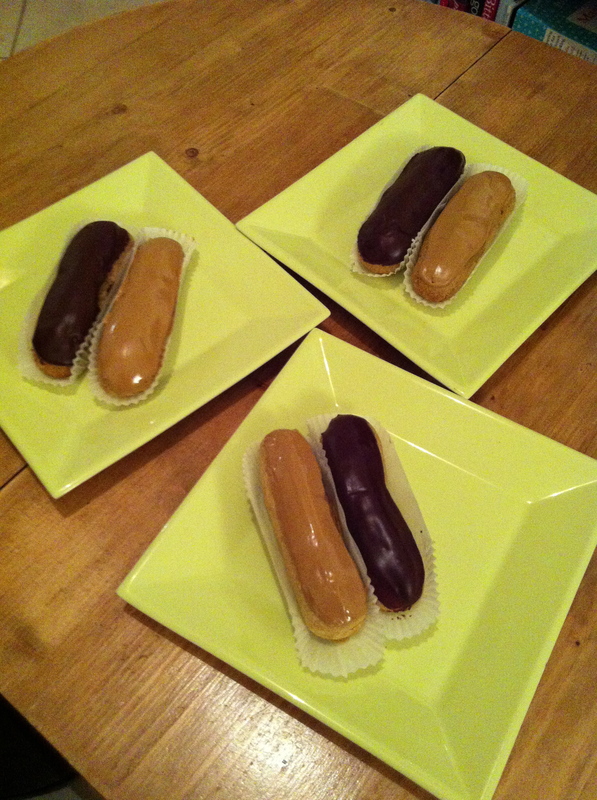 And now, in Paris, it’s eclairs. 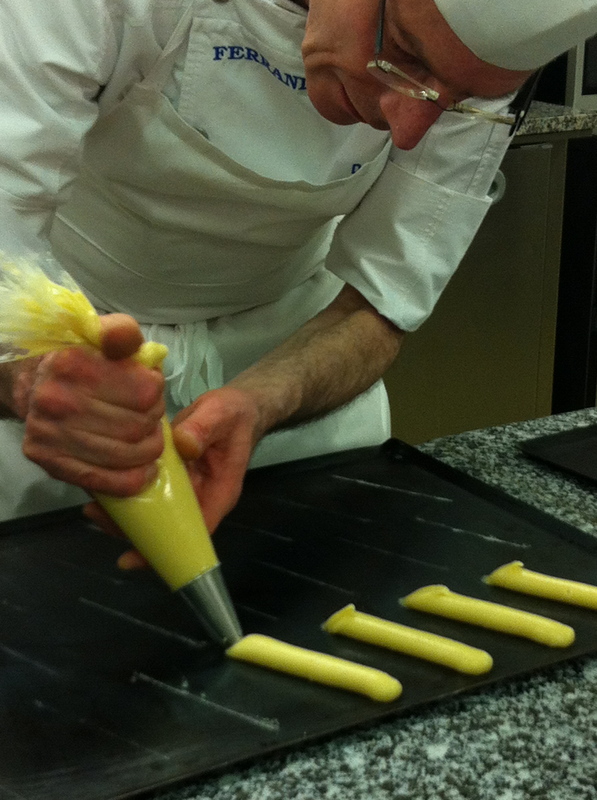 In pastry, whenever we say we ‘revisit’ something, it means to bring back in mode but evolved to the tastes of today. 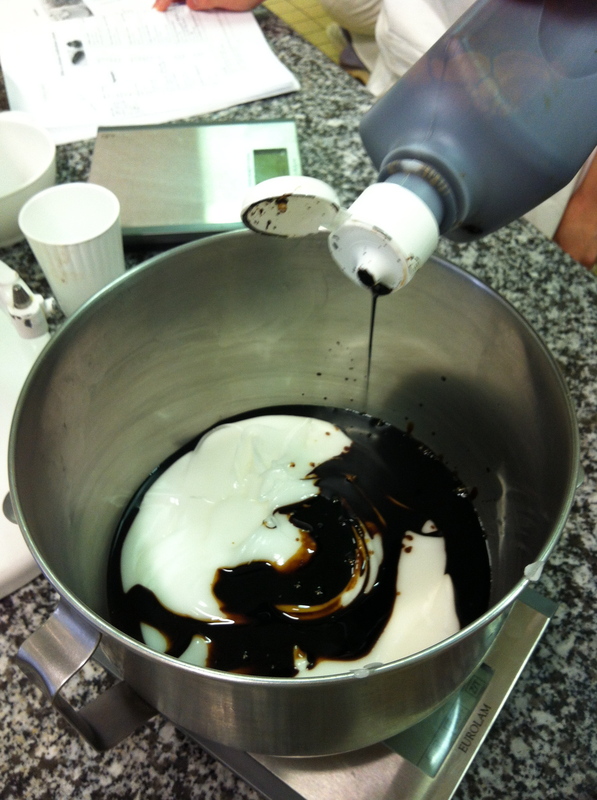 La mode of today is less butter and less heavy creams in general, and opting to push through more natural flavours, as well as, giving desserts more streamlined clean shapes. 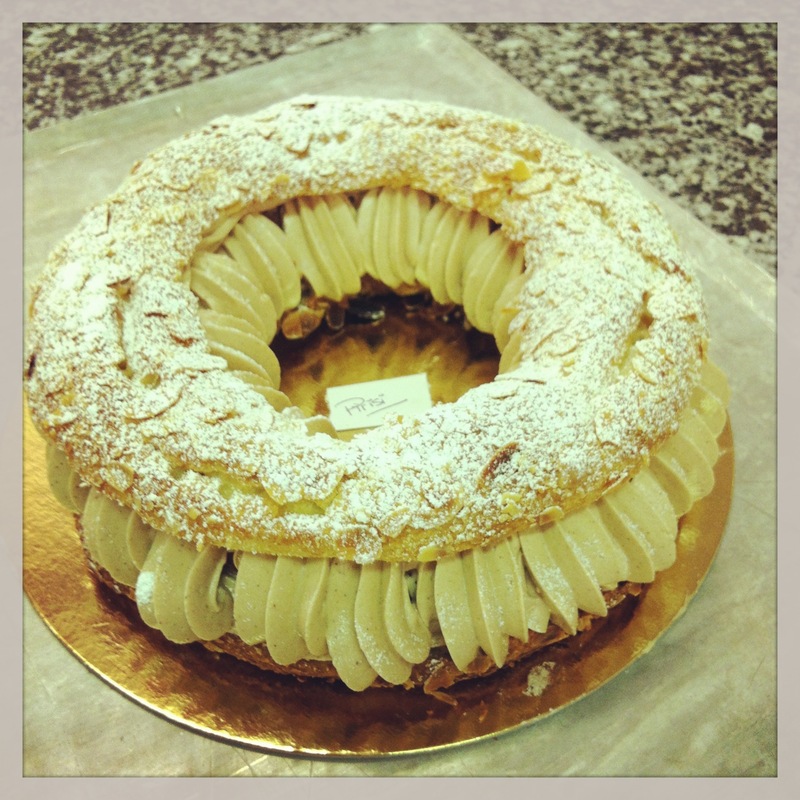 So, going back to what Chef said about the Paris-Brest being revisited. In our class recipe, we have certainly done that. There is less butter and what we use is of high quality. 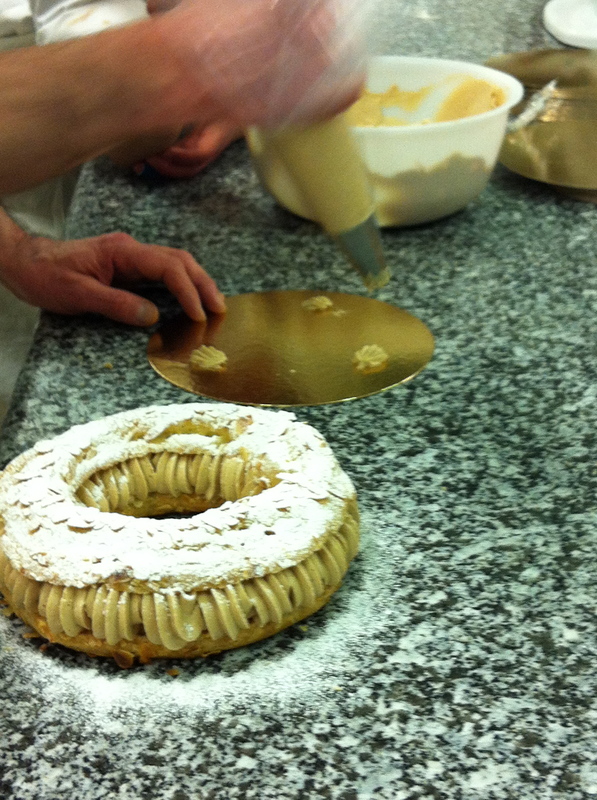 The creme patissiere we do is famously light but not light in taste. 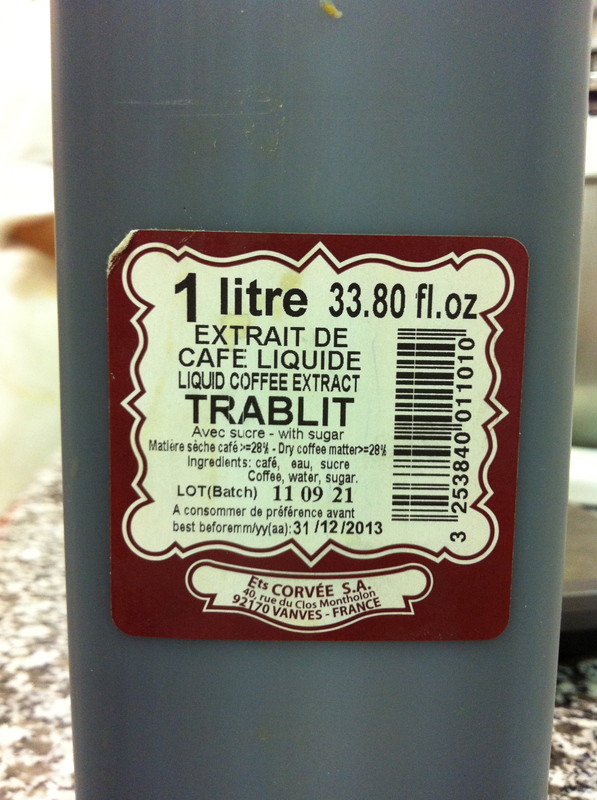 I may not have mentioned this before but the milk we use for all our recipes is in fact Demi-Crème (half fat milk). 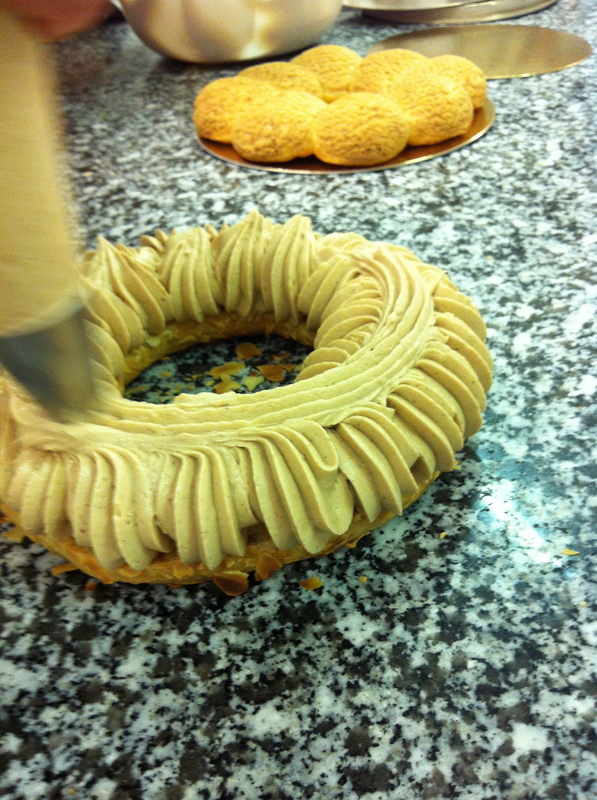 And then of course there is the principal flavour of the Paris-Brest, a high quality hazelnut/almond paste. I believe Chef has found a nice balance with this recipe in terms of the texture, form and taste. 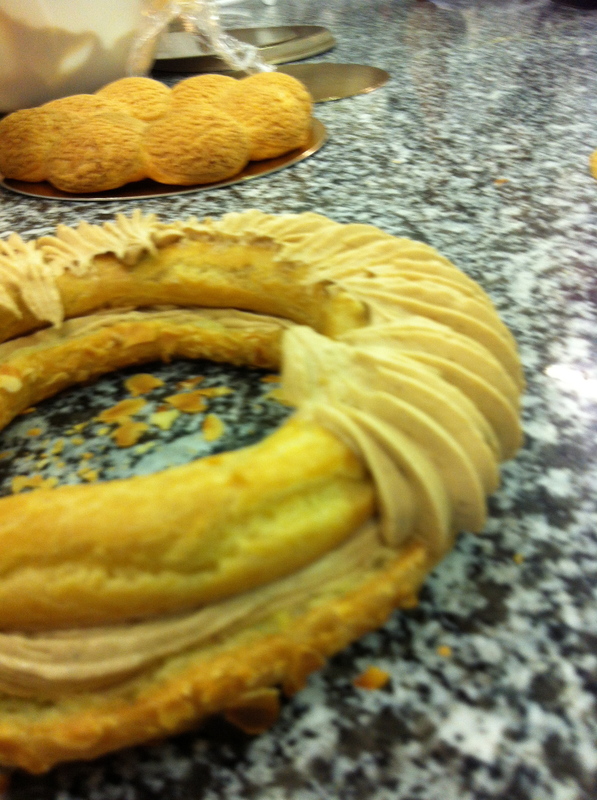 So, let’s revisit the Paris-Brest. The ingredients list I’ve posted below the photos. Note: We have NO EGG YOLKS, NO BUTTER, in this Creme Patissiere recipe. Why? Less fatty. Synopsis: So, what went wrong? 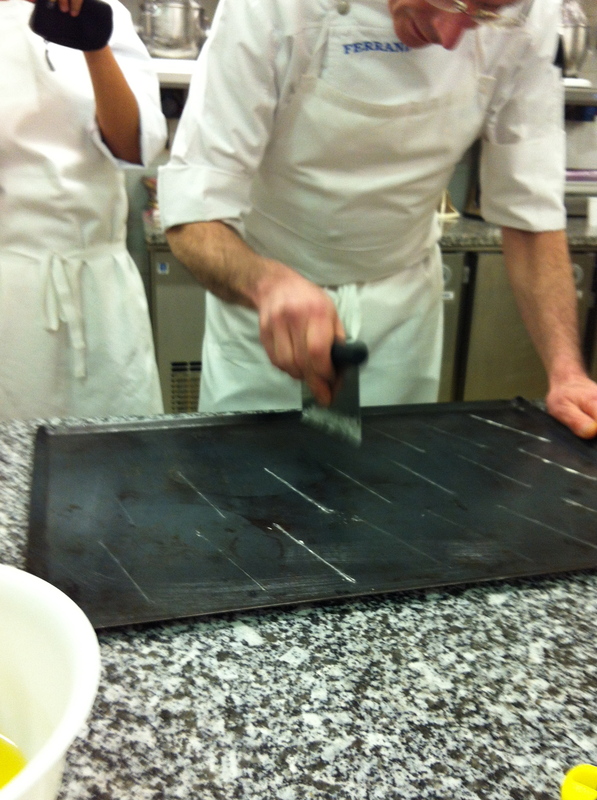 (because something always goes wrong in patisserie even the smallest of details). For the Pate a Choux: I followed the above ingredients list and my Pate a Choux did not turn out as I hoped, it was too liquidy. The reason for this, the temperature of the eggs were cold plus add a cold bowl, so instead of thickening my flour/butter/water mixture, it liquified it. In this case, I should have reduced the amount of eggs to meet the temperature of the mixture. 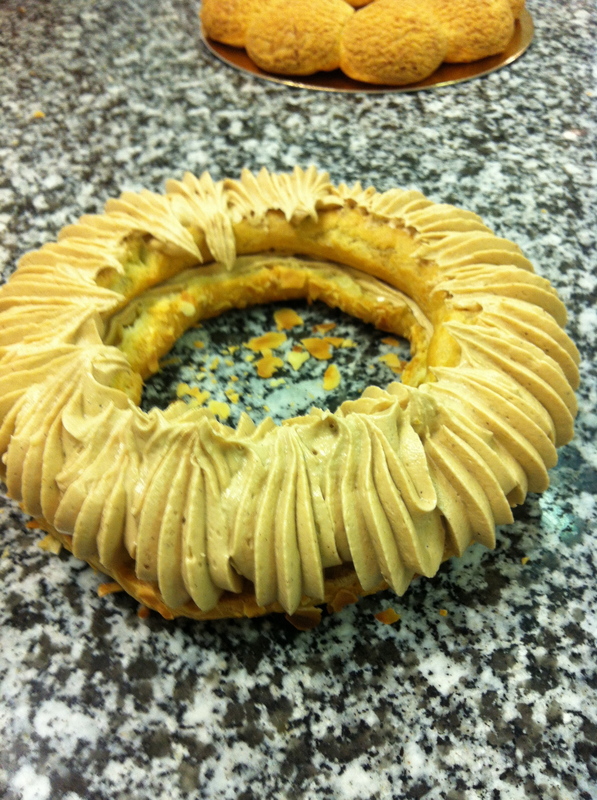 When it came to piping the Pate a Choux it didn’t have body to stand up like a good soldier. As a result, coming out of the oven, instead of a high fat sponge, I got a thin low ring of sponge. Temperature of utensils, bowls, machines, even the room can affect the outcome of your final product even if you follow the ingredients list exactly. 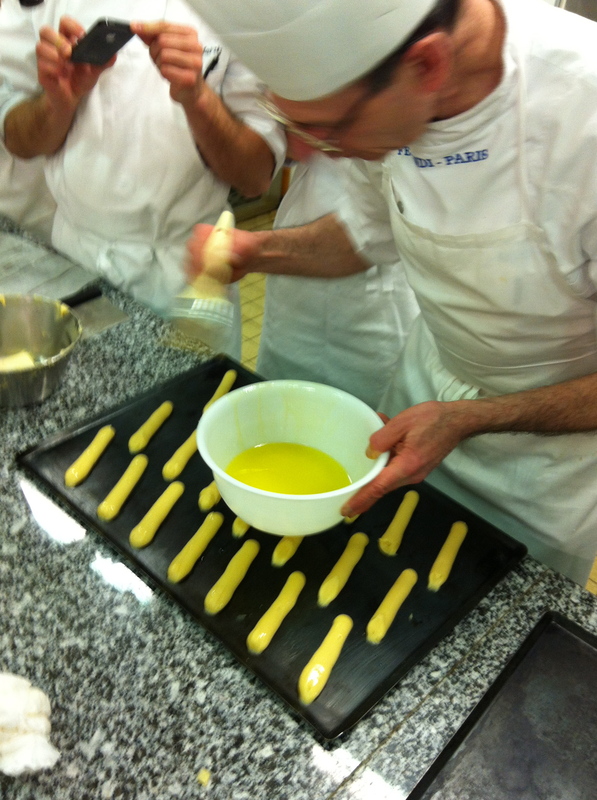 But, that’s patisserie for you = a relationship you have to work at all your life… but I’m told it gets easier. 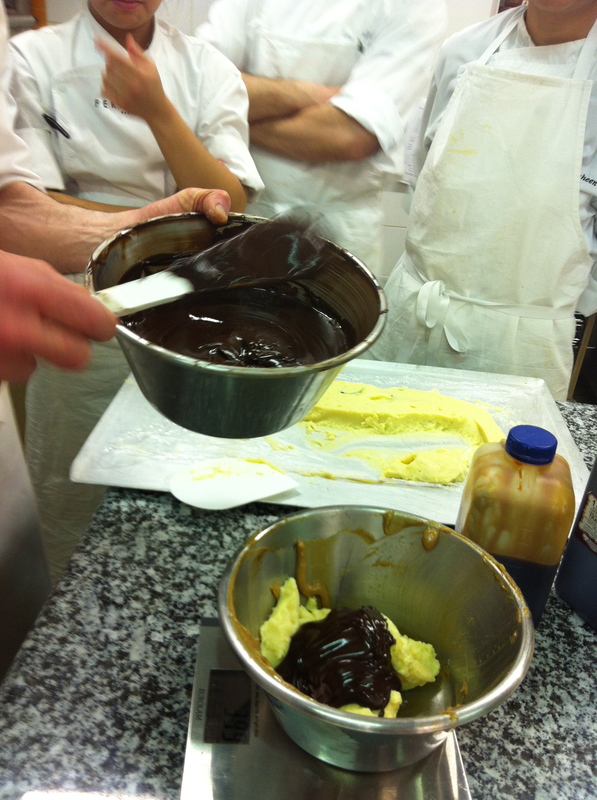 A couple of students felt we could have added more hazelnut puree. But, that kind of thing is always going to be about individual tastes, and will most probably be the most challenging part of our careers…. satisfying our customers.